Time flies, it is unbelievable that in less than a week we will say bye to May and hello to June! I hope that finally we can enjoy a bit of good weather and an entire week with no rains. Last weekend I went to the beach for the first time in this year and I was an amazing weather. I went to Conil, a small village near to Cadiz in South Spain, but at the same time at home it was raining dogs and cats and it kept raining some days. I know it is like summer storms or spring storms in this case, with no cold weather but with a lot of water hehe but I am tired of carrying my umbrella. Well, after this little moment about my rain hate and complaining about weather (what it is no relevant at all) here you have a FASHION POST!!! What a new, E.!! 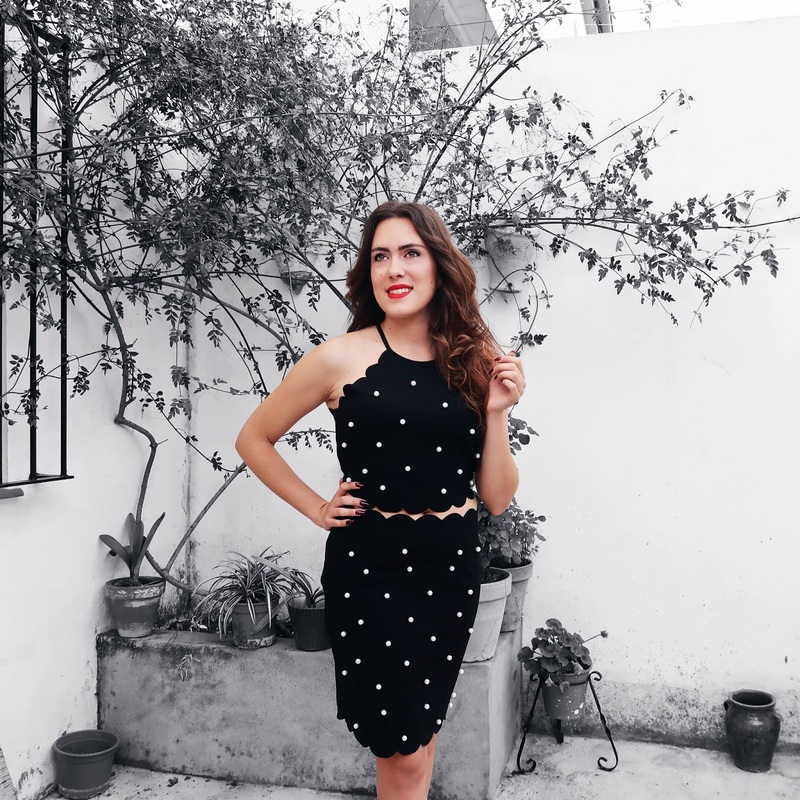 As you know, I use to buy at Shein Website a lot (most of my Mallorca summer travel outfits were from Shein) I love to buy there because they have trendy and beautiful clothes with cheap prices. I use to shop there too a lot because I finally found my perfect size of clothes, and it is a L size. I want to talk a bit about it. Most of my jeans are a 36 size and they are from brands like Stradivarius and Levis and most of my tops are a M size, I have a inverted triangle shape and it is because I haven’t got wide hips and I have bigger breast. I am trying to equilibrate my measures with exercise and I focus so much on booty workouts. The main point I want you to understand is that it is not a DRAMA to wear a bigger size, an L, XL o whatever, in some stores. Patterns are not the same but your body is the same as always and you are as pretty as always because it is not a matter of sizes. - Floral velvet bralette Top and pencil Skirt. - Bow tie open back cami Top and Shorts. - Polka dot knot back Crop Top and Skirt. Do you have two pieces looks? Let me know what your favorites are! And let’s make a small debate about the sizes topic. Bueno, después de esta pequeña intro sobre mi odio hacia la lluvia y mis quejas sobre el tiempo (lo que es completamente irrelevante) aquí tienes un nuevo POST SOBRE MODA! Pero qué novedad, E…. Como sabéis, suelo comprar en la web de Shein muchísimo (la mayoría de mis looks de Mallorca del año pasado eran de allí) y me encanta comprar allí porque tienen ropa de temporada y que se lleva y con unos precios muy competitivos. También compro cada vez más porque por fin he encontrado mi talla y es una L. La verdad es que me gustaría hablar un poco sobre esto. La mayoría de mis pantalones son una 36 y son de marcas como Stradivarius o Levis, y en cuanto a tops uso una M. Mi cuerpo tiene forma, podríamos decir, de triángulo invertido ya que tengo caderas estrechitas pero mi pecho es cosa a parte jeje En este momento estoy intentando equilibrar mis medidas gracias al deporte y me centro especialmente en ejercicios de glúteos y piernas. Contándoos todo esto, a lo que quiero llegar es a que no es un DRAMA llevar una talla más grande en otras tiendas. Los patrones no son los mismos pero tú si eres la misma persona y tu cuerpo es igual y eres igual de perfecto lleves la talla que lleves ya que eso no es cuestión de medidas. ¿Tú también tienes conjuntos? Hazme saber cuál es tu favorito y tu opinión acerca del tema de las tallas. Love this look! You look stunning! Pero bueno que conjunto más bonito, me encanta !!! Y tu estas preciosa te queda perfecto!! yo no tengo ninguno pero me encantaría hacerme con uno para este verano! en la misma tienda depende de el modelo la talla cambia! Oh yes to this outfit on you. Absolutely love this set. So beautiful and stunning. You look absolutely amazing E! That two piece is so chic and cute, and I love that it can be worn together or separately to create even more outfits. Also I love your point that it is okay to go up in sizes at certain stores. When I was younger it use to make me feel bad if at certain stores I had to go up to sizes I normally didn't wear, but you're so right that it's not your body that has changed but the stores clothing, and numbers never define how beautiful you are.